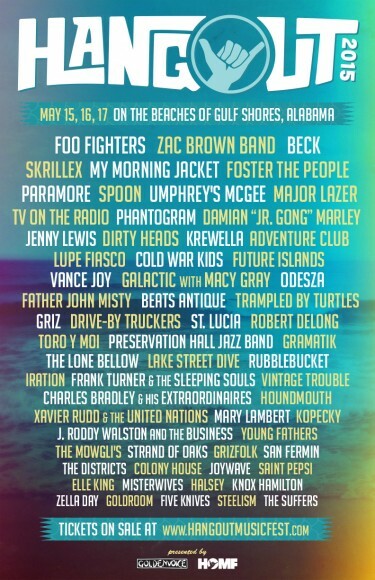 Hangout Music Festival held at the white, sandy beaches of Gulf Shores, AL has revealed their official 2015 lineup! Alabama’s Hangout Music Festival has revealed their illustrious 2015 lineup. In its sixth year, the festival will take place May 15-17, 2015 boasting headliners including Foo Fighters, Zac Brown Band, Beck, My Morning Jacket, Skrillex, Paramore, Foster the People, Spoon and more at the white sandy beaches of Gulf Shores, AL. General Admission three-day passes can be purchased for $249. VIP ticket-holders will be treated with a new perk – food prepared by award winning chefs. In addition, the VIP area will include “easy access to the festival through special entrances, prime viewing areas, including swimming pools with views of the main stage, a shaded VIP Grove with complimentary beverages as well as private, air-conditioned dining air-conditioned restrooms and more. Super VIPs will also receive 24/7 concierge services, access to a private and air-conditioned dining room and lounge featuring exclusive meals prepared by renowned chefs, golf cart chauffeur service, priority on-site lodging reservation privileges and more. VIP tickets are on sale for $1099 and a limited number of Super VIP tickets for $1699. General Admission and VIP tickets may be purchased on www.hangoutmusicfestival.com.